Being on the brink of elimination in a series can increase the sense of pressure hockey players experience… With that said, pressure gets a bad rap in sports. Pressure is not the enemy of the athlete… Pressure doesn’t have to break you. The important thing when it comes to pressure is what you do with it or how you deal with it. 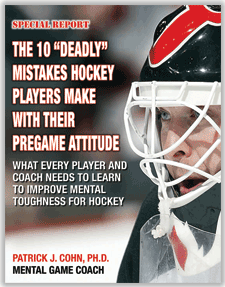 Why is it then, in an “elimination game,” some hockey players let the pressure get to them? The future is the anxiety zone… The place where ‘what ifs’ cause players to freak out. 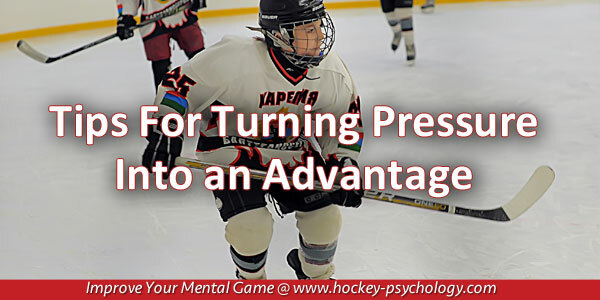 This thought process uses that sense of pressure as an ally, something that pushes you to battle for a loose puck a little more, to play a little more aggressive and to play with more grit and determination. This mindset is concerned about the present or making plays. There is still a bit of butterflies but that adrenaline rush pushes you to play a mentally tougher game. Your mindset prior to the game will dictate how you play the game. In the previous example, you see how your thoughts affect your mindset. And this will dictate your performance. The Anaheim Ducks were down 2-0 in their semifinal match-up against the Edmonton Oilers. There is no doubt the Ducks were under some pressure to turn things around and they did. The Ducks came back to win the next three games to take a 3-2 lead in the series. Even more impressive is that the Ducks’ last two wins were overtime victories, and in Game 5, the Ducks scored three goals with less than four minutes left to force overtime. Instead of allowing the pressure to get to them, the Ducks used that pressure to fuel their performance and put themselves in position to take the series. How were the Ducks able to turn things around? Anaheim goalie John Gibson stated used evidence from the past to support their ability to bounce back. The mindset you choose will affect if you win or you lose. Look for evidence to support your chances for success. If you have negative thoughts, counter those thoughts by finding examples in the past where you succeeded under similar circumstances. Let your mind work for you instead of against you. And learn how to trust the skills you have practiced with The Fearless Athlete. Discover Powerful Mental Strategies to Overcome Fear And Perfectionism! Are you frustrated with practicing harder and harder in your sport only to have your efforts undone by your mental game during competition? Do you feel like your stomach is in a ball of knots and you cant think clearly because you are so anxious and tense stepping onto the field, court, course or track? Are you envious of your competitors who seem to take their sport less seriously, but end up winning or beating you nearly every time? Many athletes experience these same feelings of anxiety and frustration. If you answered yes to any of the above questions, check out The Fearless Athlete. The Fearless Athlete is ideal for any athlete that wants to overcome fear of failure and uncover inhibiting perfectionist traits. 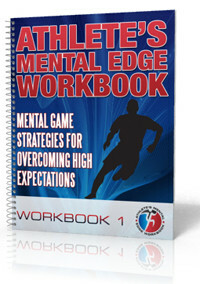 It is also ideal for any coach or parent who wants to teach athletes to perform with trust and freedom in competition.